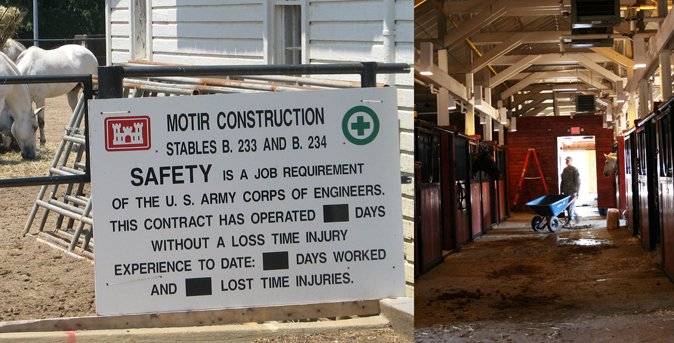 Motir Construction was awarded the contract to renovate Buildings 233 (Cavalry Stable) and 234 (Stable Guard House) at the Fort Myer Military Community in Arlington, Virginia. The proposed renovations included urgent exterior repairs and reconfiguration of interior space to support current uses as a shop, stable, and support facility for The Old Guard (TOG). Exterior repairs to the buildings included brick pointing, trim work, painting, asphalt and slate roofing replacement, improvements to ventilation, window/door replacement, and limited replacement of deteriorated finishes. The project is included in the current Federal Capital Improvements Program as well as the current approved Master Plan for Fort Myer in accordance with the NCPC Environmental and Historic Preservation Policies and Procedures and the Commission of Fine Arts guidelines.